Though Canada doesn't have an official national food, it might as well be poutine. 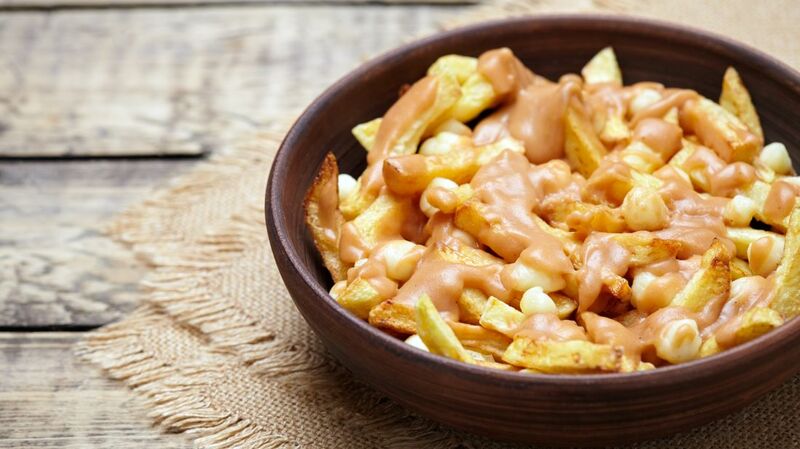 The glorious, hot combination of fries, cheese curds, and brown gravy was developed in Quebec in the 1950s, and versions of it have since spread to other countries. But if you can't find a restaurant nearby to celebrate National Poutine Day, try one of these recipes at home. Serious Eats admits that poutine is a simple dish, on paper, but the details are important. The fries must be hot and slightly crisp, the cheese must be good quality, and the gravy flavor is crucial. In their recipe for The Ultimate Poutine, you get instructions for making all three (yes, even the cheese), although some shortcuts are offered. The gravy is made with beef, chicken, and vegetables. Tieghan Gerard at Half Baked Harvest offers a somewhat simpler recipe for Authentic Canadian Poutine. In her version, the potatoes are soaked in beer instead of being rinsed in water, and the gravy contains beer as well. Canadian beer, of course! Developed by Chef Charlene Rowland at Wayne Gretzky’s restaurant in Toronto, this Maple Bacon Poutine variation adds not only bacon, but also bourbon and maple syrup to the gravy (plus a hint of cayenne pepper for a kick). Classic poutine is for those who don't worry about their fat, salt, or calorie consumption, or who see it as a rare treat. But if you're looking for all the satisfaction in a healthier package, EatingWell magazine offers a recipe for Oven-Fry Poutine with Mushroom Gravy, which skips the deep-frying and uses lower-sodium ingredients. You can give your homemade poutine some California flair with avocados. Gaby Dalkin at What's Gaby Cooking lays out a recipe for Cheesy Avocado Bacon Poutine that tops the fries and cheese with bacon, onions, and tomatillo avocado salsa. Sweet potato fans will want to try using oven-baked tubers for chef Marc Matsumoto's Sweet Potato Poutine. The sweet potatoes give a nice balance to the other salty ingredients and make for a great use of fall farmers' market finds. Heather Hands at Flourishing Foodie made a Vegetarian Poutine that differs from the basic recipe only in that the gravy is made of vegetable stock, and the potatoes are baked with olive oil, so are a little healthier than the deep-fried version. Greek-Style Poutine contains the requisite fries, gravy, and cheese, but this time, the cheese is Greek Kasseri cheese (a sheep's milk cheese), and it also contains Kalamata olives and two kinds of sausage. As served by Edible Canada Bistro, this recipe for Quebec Duck Poutine has gravy made with broth stewed from duck bones, plus a couple of eggs sunny-side-up added on top for good measure. Using poutine as a pizza topping is fusion dining at its finest. You can make it a homestyle treat with roast beef and mozzarella with this Poutine Pizza recipe from Food.com, or you can cut the overall prep and bake time in half—Spoon University, which specializes in quick and simple recipes for college students, offers Jessica Chiarello's quick-and-easy method for making poutine pizza. Relax, this is nothing like classic poutine; it only looks like it. Ricardo Cuisine's Dessert Poutine is made of churros (fries) with marshmallows (cheese curds) drizzled with caramel sauce (gravy). Though, maybe it does resemble classic poutine in one regard: the calorie count!